Things have gotten quite complex. Business is evolving rapidly and information changes by the minute. Technology with all its amazing ability to aid in the learning process, can also serve to overwhelm. The shear volume of choices and voices that are laid before me (or rather found in my inbox and within my streams) can sometimes paralyze. Clay Shirky stated: “It’s Not Information Overload, It’s Filter Failure.” So filtering out the noise is the first step I’ve undertaken but it’s not the only step needed. A lot of immaterial stuff gets filtered out but even the good stuff is only good at the right time and situation. I need to better allow the incidentals to slip by and better enable the essentials to adhere. To do this I need to employ a framework not just a filter. I need to be ever mindful of taking the complex notions of what enables learning and reduce it to simpler ones; So professionally and personally I resolve then to keep the essentials of “real learning” at the forefront. The beauty in these 4 simple truths is that they do not favor formal or informal learning but in each it is critical that all 4 are attended to. Real learning will also serve me well as a lens that I can view each of my approaches and in particular I aim to put more emphasis on reflection. Reflection is, at a minimum, 1/4 of the equation and in my opinion is needed much more. Coupled with conversation these two easily make up the majority of real learning and yet, for most organizations it is by far the least attended to. Reflection is about opportunity. People can’t be forced to reflect on content or an experience but the opportunity can be enabled/supported with ample space and time. Reflection is also a personal goal and I look to real learning as a framework for my own growth. I hope to better incorporate it in my Personal Knowledge Management (PKM) strategy. Currently my experiences, practice and conversations dominate my time but I realize that I don’t take enough time to pause and process all I am working on and with. 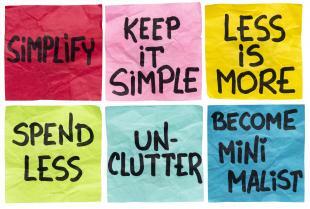 I look forward to simplifying and slowing in 2013. Mark is currently the Manager of Corporate Training at Systems Made Simple. With over 12 years in L&D, Mark strives to challenge conventional beliefs about organizational learning by leveraging collaborative technologies and user-generated content to improve performance. He can be found on Twitter and his blog LearningZealot.